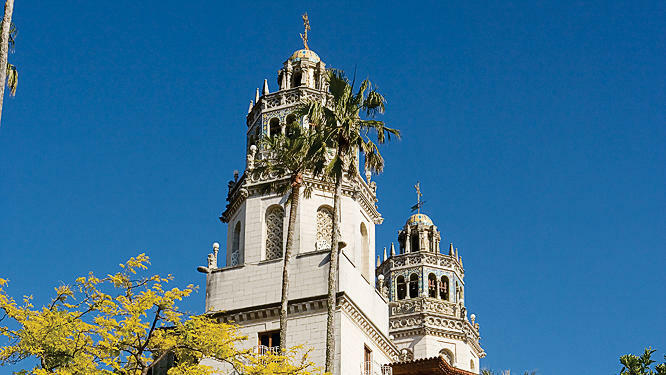 William Randolph Hearsts castle still enchants. Four Seasons Resort Santa Barbara. Oceanfront classic. From $500, two-night minimum on weekends. 1260 Channel Dr., Santa Barbara; www.fourseasons.com/santabarbara or 888/424-5866. La Super-Rica. Mexican food well worth long peak-hour waits. $; lunch and dinner daily. 622 N. Milpas St., Santa Barbara; 805/963-4940. Patrick’s Side Street Cafe. Wine country cuisine in relaxed setting. $$$; lunch and dinner Wed-Sun. 2375 Alamo Pintado Rd., Los Olivos; 805/686-4004. The Carlton Hotel. Handsome, restored hotel near Paso Robles wine country. From $225. 6005 El Camino Real, Atascadero; www.the-carlton.com or 877/204-9830. 21st Street Drive-In. Sip a root beer at this vintage drive-in. $; lunch and dinner daily. 2110 Spring St., Paso Robles; 805/238-0360. Green Gables Inn. Victorian elegance by the sea. From $120. 301 Ocean View Blvd., Pacific Grove; www.greengablesinnpg.com or 800/722-1774. Inn at the Pinnacles. Ideal wine country setting at the gateway to Pinnacles. Open weekends only; from $200, two-night minimum. 32025 Stonewall Canyon Rd., Soledad; www.innatthepinnacles.com or 831/678-2400. Loulou’s Griddle in the Middle. Updated take on waterfront breakfast joint. $; breakfast and lunch daily. On Municipal Wharf II, Monterey; 831/372-0568. Monterey Bay Inn. Newly renovated hotel on waterfront. From $199, two-night minimum on week-ends. 242 Cannery Row, Monterey; www.montereybayinn.com or 800/424-6242. Casanova Restaurant. Classic romantic setting, Mediterranean cuisine. $$$$; lunch and dinner daily. Fifth Ave. between Mission St. and San Carlos St.; 831/625-0501. La Playa Hotel. Onetime Carmel estate a couple of blocks from Carmel City Beach. From $180, two-night minimum on weekends. Camino Real at Eighth Ave.; www.laplayahotel.com or 800/582-8900. Big Sur River Inn. After a meal of fresh fish and organic produce, kick back in a chair in the river. $$; breakfast, lunch, and dinner daily. On State 1 at Pheneger Creek; www.bigsurriverinn.com or 800/548-3610. Big Sur Roadhouse. Cal-Latin fusion cuisine with funky roadhouse decor. $$; dinner Wed-Mon. On State 1, about 25 miles south of Carmel; 831/667-2264. Treebones Resort. Upscale camping, where roughing it includes a morning waffle bar. Campsites from $55 and yurts from $129, two-night minimum on weekends. 71895 State 1, 1 mile north of Gorda; www.treebonesresort.com or 877/424-4787. California missions. There are eight missions along the way: Santa Barbara, Santa Ynez, La Purísima (now La Purísima Mission State Historic Park), San Luis Obispo, San Miguel, San Antonio, Soledad, and San Carlos (Carmel). We like Purísima for its meticulous restoration and Santa Barbara for its sheer beauty. Fees vary by mission. www.missionsofcalifornia.org for locations and details. Ed Ricketts’s Lab. Mentioned in John Steinbeck’s Cannery Row, the historic site is occasionally open to the public. On Cannery Row, Monterey; visit www.canneryrow.org for details. Hearst Castle. A classic example of California history and architecture. Five different tours available this month. From $24, reservations recommended. 750 Hearst Castle Rd., San Simeon; www.hearstcastle.com or 800/444-4445. Henry Miller Memorial Library. Gallery with concerts, lectures, and other events. 11-6 Thu-Sun; free. On State 1, Big Sur; www.henrymiller.org or 831/667-2574. Julia Pfeiffer Burns State Park. About 10 miles of trails, including the 0.5-mile round-trip Overlook Trail, which offers a view of a waterfall dropping 80 feet into the ocean. Free. On State 1, 37 miles south of Carmel; www.parks.ca.gov or 831/667-2315. Monterey Bay Aquarium. The nation’s top aquarium has added a new octopus habitat and a walk-through wave-crash exhibit. 9:30-6 daily; $22, $10.95 ages 3-12. 886 Cannery Row, Monterey; www.montereybayaquarium.org or 831/648-4888. Oso Flaco Lake. Rare coastal lake and dune habitat. $5 per vehicle. About 3 miles north of Guadalupe, turn west at Oso Flaco Lake Rd. and continue about 3 miles to parking area at visitor center (closed Mon; 1055 Guadalupe St./State 1, Guadalupe); www.dunecenter.org or 805/343-2455. Pfeiffer Big Sur State Park. Plenty of redwood-shaded picnic space and trails that lead to swimming holes; try the 1.5-mile round-trip Pfeiffer Falls Trail. $8 per vehicle. On State 1, 26 miles south of Carmel; www.parks.ca.gov or 831/667-2315. Pinnacles National Monument. Dramatic volcanic outcrops and even California condors. $5 per vehicle. From U.S. 101 in Soledad, take State 146 12 miles east. www.nps.gov/pinn or 831/389-4485. Point Lobos State Reserve. The 1.4-mile North Shore Trail offers the best look at the reserve’s coves and forests. 9-7 daily; $8 per vehicle. www.pointlobos.org or 831/624-4909. Sebastian Store. Restored 19th-century general store at San Simeon Cove. Closed Thu. 805/927-4217. Chalone Vineyard. 11:30-5 Sat-Sun and by appointment; $5 tasting fee. State 146 E. at Stonewall Canyon Rd., 9 miles east of Soledad; 831/678-1717. Domaine Alfred. 10-5 daily; $6 tasting fee. 7525 Orcutt Rd., San Luis Obispo; 805/541-9463. Garretson Wine Company. 11-5 daily. 2323 Tuley Court, Paso Robles; 805/239-2074. Foxen Vineyard & Winery. 11-4 daily; tasting fee from $5. 7200 Foxen Canyon Rd., Santa Maria; 805/937-4251.